The Manning Regional looks like the Art Gallery of NSW with Jocelyn’s work on the walls: 30 years of oils and watercolours to which the only applicable adjective is masterful. Her long compositions play out like melodies: myriad figures in motion, turning, twisting, gesticulating, leaning, living. Jocelyn has only ever worked in the classic mediums, which make no concessions to drying time or solubility: they just glow. For one thing, she likes painting blokes best. Fishermen especially. Also swimmers and sunbathers and rockpoolers. Her partner, Robin Norling, senior education officer of the Art Gallery of NSW, had a house on the beach. “It doesn’t seem right that Robin isn’t here,” John says. A ripple of agreement goes through the crowd. It’s been a year since Robin’s death, and Jocelyn’s grief is still palpable. She repeats John’s sentiment. Jocelyn gives me a curious look. I explain my reasoning. As a newcomer to the area, I only knew them as a distinguished older couple who appeared from time to time at openings amid reverential whispers. She laughs a rare laugh. I’m speaking with Jocelyn Maughan, head and founder of Meadowbank TAFE Art School, which under her leadership became renowned for drawing and employed hundreds of teachers. “Ah, so you were the boss,” I say. She does have an enviable self-possession, one earned from a lifetime dedication to craft. She seems satisfied with the exhibition, leaning back in an armchair, surveying. She’s about to turn 80. When she moves, she has what I think of as a painter’s gait, a little stooped but certain, eager, always ready to seize a moment. The visitor nods humbly: it’s local institution Rick Reynolds. Later, another local artist, children’s book illustrator Stephen Michael King, tells me that Jocelyn was one of his teachers. “Hmmm?’” Jocelyn asks, in the middle of a portrait, her eyes on her subject. She still loves teaching. When she sees my interest, she invites me to sit and watch over her shoulder. She works simply, on a board in a corner by a window, from a simple wooden box containing a limited palette of quality paints, in an apron jewelled by her brush. Jocelyn makes a dismissive noise, as if to tssk away all convention for good. It’s uncanny how much she reminds me of my Jewish granny, also a painter and a teacher of painting, also frank and eccentric. I watch her knock out three portraits in a row, an hour a piece, with short breaks for tea in between. If anything, she seems energised by the work. I’m amazed by the way she captures not just likeness but character, and more than that which meets my eye. Of a forensic psychologist, comes a portrait light and youthful. “Don’t distract him,” Jocelyn says, annoyed to find her sitter turning. Though she no longer holds classes, she’s generous with her knowledge. She’ll sit with anyone and their sketchbook. “Ahh,” I say, beginning to understand. I take another long look around, at the scenes of our famously beautiful north coast, of its characters and communities, as she and Robin must have seen them, travelling and making pictures together for half a lifetime. She takes us on an impromptu tour, revealing the secrets behind each work, explaining the composition and colour theory, sharing her techniques. “I could hug you,” I say afterwards. “I’ll take that,” Jocelyn says, and gives me one. Jocelyn Maughan’s retrospective, Inspirations: Blackhead to Patonga, is on at the Manning Regional Art Gallery until March 25. 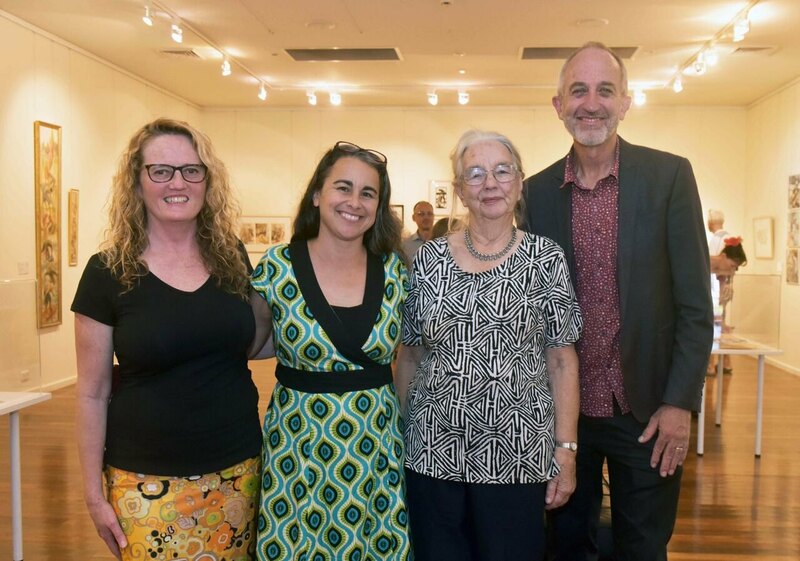 Above (from left) Jane Hosking, Rachel Piercy, Jocelyn Maughan and Johnathan Cooper. Photo by Julie Slavin. Story by Tessa Kerbel.